Manufacturing in China can save you a lot of cost, but it can come with problems such as miscommunications, delivery delays, inferior quality and the paperwork surrounding importation. However, Toolcraft have developed an excellent working relationship with our Chinese partner and so Toolcraft's Chinese injection mould tools are the best choice for you if your project needs the cost savings of Chinese-made mould tools, combined with the peace of mind of having a UK contact and Toolcraft's guarantee. Once the injection mould tools have been made, we can make your mouldings here in the UK, ensuring a continuous and fast supply of your plastic parts. 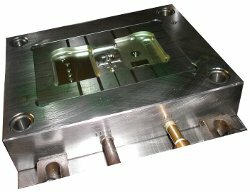 We've worked with our Chinese partner for over 5 years and have provided a large range of customers with injection mould tools and associated precision mouldings in this way. Have a look here for a schematic overview of the Chinese Mould Tool Manufacture Process. Our other tool options include: aluminium alloy mould tools, insert only mould tools and steel mould tools. We worked extensively with James Caldwell, the Designer and Projects Manager at Toolcraft, on the waterproof case and docking station for our revolutionary new paging system. Throughout the design, modelling, mould tool manufacturing and injection moulding process, Toolcraft provided excellent service. The injection mould tools were made by Toolcraft's Chinese partner, but Toolcraft project managed, guaranteed and imported them. The product changes we needed during the process were made quickly and reliably & the end result is excellent. Ready to get excellent injection mould tools at great prices ? Get a Quote !